Affascinante, appartamento completamente rinnovato, è parte di una casa di capitano di mare costruita nella metà del 1800 e si trova su 2 acri destra sulla US 1. Ha un ingresso privato e comprende un patio privato con tavolo da picnic e barbecue. L'appartamento è composto da soggiorno con TV a schermo piatto, grande bagno con vasca / doccia, camera da letto matrimoniale, cucina abitabile completamente attrezzata con elettrodomestici nuovi, tra cui forno a microonde e caffè Keurig / tè. Camera da letto e da bagno sono inclusi. Wifi disponibile in tutto. Parcheggio privato senza alcun costo aggiuntivo. Labor Day weekend trip to see the Acadia area and coastal Maine for its fishing villages and lighthouses. Getting around Coastal Maine is by 2 lane roads so quickness is not part of the game. 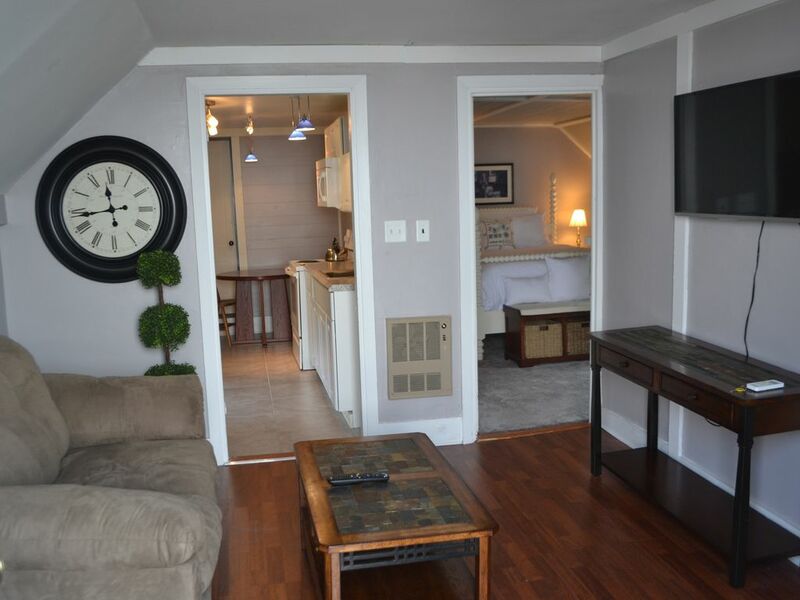 This apartment is in an old farmhouse, upstairs with updates. We were missing a few necessities and called Brenda the first morning. Before we left Michael arrived with everything and more. They are helpful and attentive hosts. Comfortable bed, good shower, basics in the kitchen. We ate breakfast there both other meals were eaten out. Good size TV but cable stations are limited. WiFi works great. It is on Hwy 1 so don't expect silence but the road noise was not bothersome to us. Located on outskirts of town so not walkable to restaurants but easy access to good places and to a good size grocery store. Thanks so much for your review....glad that you found the apartment comfortable. We always want our guests to feel comfortable; so was happy to add anything that was missing. Thanks so much for staying with us! The location was convenient for access to Acadia National Park. It is however, located on Hwy 1 which was very busy/noisy all the time. The cute little sitting area as shown in the pictures was not very useable due to the noise. Linens were very nice. Lighting was very poor. Kitchen was sparsely furnished. Nice to have access to the campground across the Hwy. Thanks for taking the time to write a review. Just wondered what else you would like to have found in the kitchen (so we can add other things that might be useful). Situato sulla US 1 lungo la strada da un popolare campeggio che offre kayak, sentieri, nuoto e del puntello cene (aragosta). La città di Searsport, con una ricca storia marinara, negozi di antiquariato, ristoranti, parchi lungomare, e il Museo Marino Penobscot, offre ore piacevoli di interesse. L'appartamento è facilmente raggiungibile a piedi a Moose Point State Park e solo a poche miglia a nord di Belfast ... a metà costa tra Camden e Bar Harbor ... senza tutte le folle. La costa del Maine al suo meglio!